There are so many things I love about weaving. The process is fairly complex but that simply means that the weaver can intervene in any number of places along the length of the process and create interest. 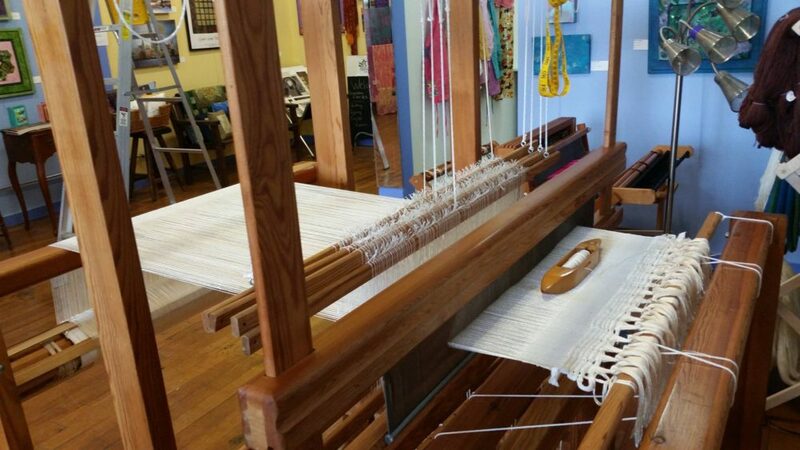 Change made prior to going on the loom, manipulations while it is on the loom, innovations in the post loom process….all of these can create complexity and interest. I have to admit I don’t really like most 4 harness twills but I love being able to paint a warp before it goes on the loom, or insert the shibori resist threads for dyeing after the cloth is finished. Shibori on the loom is the plan for these 600 threads on the Glimakra. By inserting threads while I’m weaving that will be used to gather up folds and creases after the cloth is cut off, I can overlay weaving patterns onto the plain weave, or do more traditonal shibori patterning like arashi (pole wrapped) or mokume (wood grain). Plus, the use of a little thickener in the fiber reactive dyes does mean I’m not limited to the traditional indigo color (though I love indigo). Clearly, it will be too much fun!